Hopefully many of you will know Fort Robinson. If you don't, you're in for a treat. 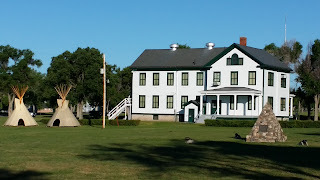 If you know about Fort Rob, but have never visited, or it's been a long time since you visited - don't wait! This is a wonderful Nebraska treasure and should be on your list regularly! Beautiful landscaping in front of the stables. Fort Robinson is located in the far northwestern corner of Nebraska. The closest town is Crawford, and it's about 30 miles west of Chadron. This area of Nebraska is known as the Pine Ridge, and it is absolutely gorgeous - and filled with history and western culture. 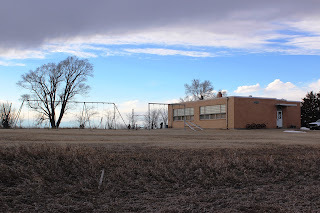 The history of Fort Robinson is the history of the American west. 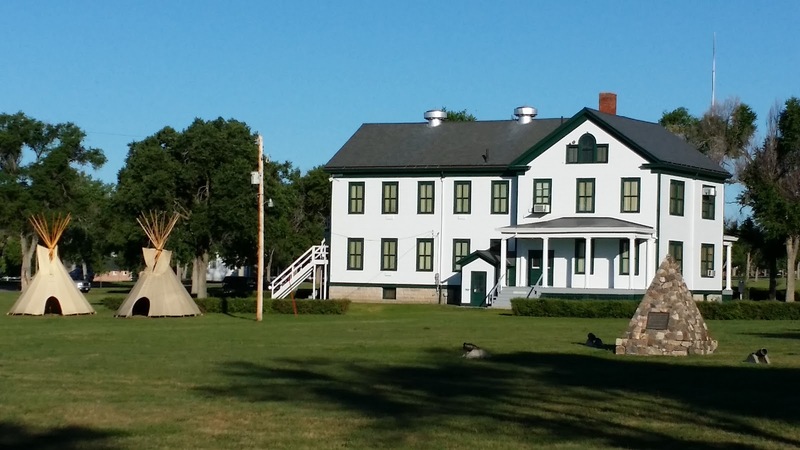 It began in the early 1870's as an army outpost to provide support to the Red Cloud and Spotted Tail Indian agencies. The fort was active throughout the turmoil surrounding the Indian wars through the 1870's and into the 1890's. It is the site of the death of Crazy Horse in 1877; The 9th Calvary or Buffalo Soldiers served here beginning in 1885; It is the site of the heartbreaking Cheyenne Outbreak of 1879; Dr. Walter Reed served as the post doctor from 1884 to 1887; "Old Jules" Sandoz was treated here by Dr. Reed; It served as an army remount depot during World War I; It served as a K9 training center and prisoner of war camp during WWII. One of the wonderfully restored officer's quarters open for lodging. After it was decommissioned in 1947 it was turned over to the USDA to become a beef research station. Sadly, it was badly understaffed, and as buildings fell into disrepair because the staff was insufficient to maintain them, they were demolished. The hospital and many of the barracks fell prey to this neglect. Finally, the locals became disgusted with this destruction of their heritage and petitioned the government to "cease and desist". The research station was relocated and the fort was turned over to the Nebraska State Historical Society and the Nebraska Game and Parks Commission to develop as a State Historical Park. Reconstructed buildings - the far left is the guard house where Crazy Horse was killed. The far right is the barracks where Dull Knife's Northern Cheyenne were held before the break out. 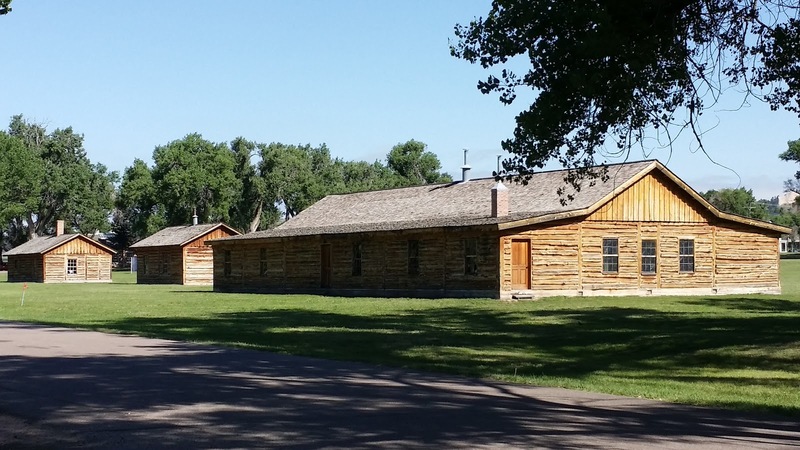 Fort Robinson State Park visitors can choose lodging from rooms in the 1909 enlisted men's quarters or "cabins" ranging from sleep 2 to 20 in the former officers quarters that date from 1874 to 1909. All cabins have kitchens, baths and bedrooms. Larger cabins also feature living rooms. Cabins are furnished with blankets, towels, stoves, refrigerators, silverware and cooking utensils. Lodging is available from mid-April through mid-November. Lodge rooms have double or twin bed rooms; Cabins & Adobes sleep 6 to 12 people; Brick officers Quarters sleep 14 to 20 people; Comanche Hall can handle family reunions as it sleeps up to 60 people and has a complete kitchen. Housekeeping cabins are supplied with linens, basic cooking utensils, dishes and silverware. You may also reserve a picnic shelter for your group or family reunion. Group and meeting facilities include Dodd Hall, Buffalo Soldier Barracks, the Mare Barn Annex and Buffalo Barracks Squad. Dodd Hall and the Buffalo Soldier Barracks can seat up to 200 people and the mare Barn Annex seats up to 125 people. Buffalo Barracks Squad Meeting Room seats 120 people and includes a small kitchen. 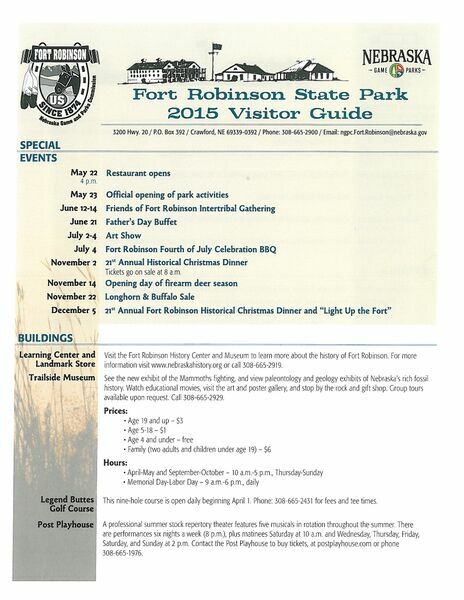 Don't forget to ask about having the Fort Robinson Restaurant cater your next group or meeting event. The parade grounds of the fort. The building houses the historical museum. There is also an excellent campground - which is what we took advantage of. Our campsite was in the Soldier Creek campground, and was right next to the creek. At night, bats would fly out of the creek bed and skirmish crazily with the mosquitoes. Given that the bugs weren't too bad, I would have to guess the bats won. 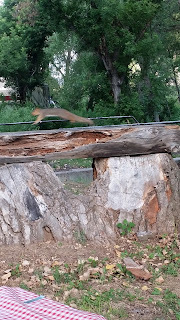 A friendly squirrel even greeted us in the morning searching for handouts. Northwest Nebraska is an entirely different experience than the rest of the state. They say Nebraska doesn't have mountains, and in height, they're right, but the Pine Ridge area, with its soaring buttes, tall pine trees and rural roads winding through fantastic scenery makes you feel as if you are in the mountains. Except that they are extremely uncrowded! Red Cloud Buttes in the distance from the vantage point of the jeep tour. 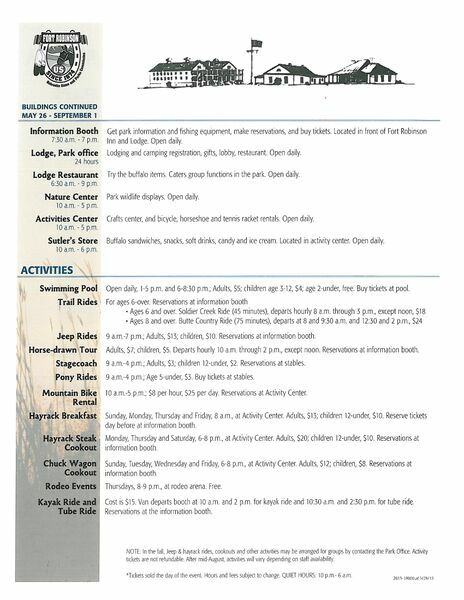 Our fifteen and four year old granddaughters loved that Fort Robinson has a swimming pool. The four-year-old also loved the pony rides! Mark and son-in-law loved that it was directly adjacent to the Legend Buttes Golf Course. I loved the history, and our daughter, who was six months pregnant just enjoyed relaxing! We took in as many of the incredible activities at or near the Fort as possible. Trail rides, pony rides, the horsedrawn history tour, jeep ride, steak dinner cookout, museum tours, rodeo. You can easily immerse yourself in nature and in the incredible history of the area. Monument commemorating the Cheyenne Outbreak on the surmised path of the survivors into the hills south and west of Fort Robinson. 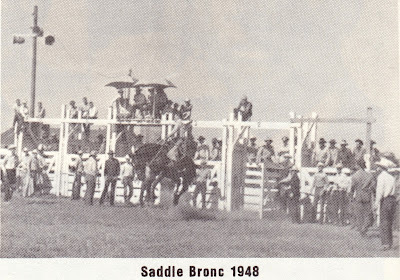 Unique performance in the Thursday night "rodeo games" a calf-skin sled race. The Trailside Museum featuring "Clash of the Titans". The Nebraska Game and Parks Commission preserves and operates most of Nebraska's public lands and historical parks, but that doesn't mean that they know how to market it or provide the information that visitors are looking for. Finding out just what is going on, how much it costs, and the schedule takes you down a rabbit hole on the Internet. Below is the schedule of events and the cost in July of 2015. One thing we didn't get to experience was the Post Playhouse. A long-running professional summer stock theater, the Playhouse hosts several productions each season, with about 12 performances each week. When you know the dates of your visit, check the Playhouse schedule and get your tickets ordered. They sell out quickly! Finally, if you're looking for an incredible summer job, consider applying! According to employees at the park and locals we spoke to in town, the park generally employs around 150 during the summer travel season, but this year they were down around 50 employees. You could see it in the maintenance, shortened hours in some of the amenities, and in the quality of some of the activities.